Florida State University appears in our ranking of the 30 Best Online Schools for Graduate Degrees. 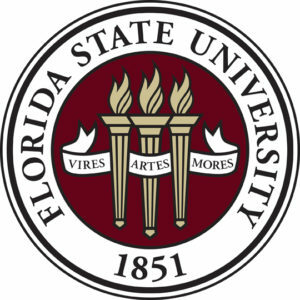 Florida State University offers several hundred options for degrees at its Tallahassee campus, as well as through its distance learning program. Those degrees are offered by 16 colleges that include various labs, institutes, and facilities for student study and research. Colleges that house degrees include the College of Arts and Sciences, the College of Criminology and Criminal Justice, the College of Fine Arts, and the College of Social Sciences and Public Policy. Highly regarded degrees include the school’s library media program, which was ranked first in a list by “College Choice,” and the film program, which is highly ranked by “The Hollywood Reporter.” Popular majors include those in the arts and sciences, business, the social sciences, and public policy. In 2018, the school awarded more than 2,800 degrees in the arts and sciences and more than 2,000 degrees in business. Degree levels at Florida State University include bachelor’s, master’s, specialist, doctoral, and Juris Doctor. Students can also enroll in joint degree programs, seek a Doctor of Medicine degree, a Master of Law Letters degree, or a Juris Master’s degree. The university offers all of its programs at the Tallahassee campus with some of those programs also offered at the Panama City campus. As one of the most popular areas of study, the College of Business offers standard degrees in business administration, finance, and accounting, as well as specialty areas like real estate, risk management, hospitality, and professional sales. Students can even earn a degree that spans multiple areas with the MSW/MBA program that awards a Master of Social Work and Master of Business Administration at the same time. Students who choose the popular College of Social Sciences and Public Policy will also have access to many exciting degrees like a graduate degree in demography, one in geographic information science, and another in international affairs. The university also has a comprehensive department for urban and regional planning with six degree programs available in areas like demography, public health, international affairs, and public administration. Students interested in online study will attend the Florida Virtual Campus and enroll in one of several degree and certificate programs. At the undergraduate level, students can study topics like crime scene investigation, law enforcement intelligence, computer science, and criminology. Certificates include those in Leadership Studies, U.S. Intelligence Studies, and Multicultural Marketing Communication. For graduate study online, students can study topics like management information systems, risk management & insurance, instructional systems & learning technologies, and social work. The university also offers many graduate certificate programs online that include topics like social work, human performance technology, and nurse leadership. Testing for online programs occurs as proctored exams at an external site or on campus. Florida State University is located in Tallahassee, Florida and is part of the State University System of Florida. The Tallahassee branch has almost 42,000 students enrolled in its 16 distinct colleges, which offer more than 360 degree variants. The school’s sports teams have been very successful over the past century in their NCAA Division I games within the Atlantic Coast Conference. In addition to its status as a state university, the school is also a space-grant and sea-grant institution. The university’s motto is “Strength, Skill, Character,” and the school’s endowment is more than $742 million. The school has almost 6,000 academic staff, more than 8,100 administrative workers, and a yearly budget of $1.7 billion. The school’s official colors are gold and garnet, and the sports teams are nicknamed the Seminoles. Florida State University receives its regional accreditation from the Southern Association of Colleges and Schools. The university is also part of the Association of Public and Land-Grant Universities, the Southeastern Universities Research Association, the University Corporation for Atmospheric Research, and the Universities Research Association. Many programs are also accredited by various agencies. For example, the Council on Social Work Education (CSWE) has accredited the Master of Social Work program. The university’s programs in engineering are accredited by the Engineering Accreditation Commission of ABET, Inc. The programs in medicine are accredited by the Liaison Committee on Medical Education. The school’s pre-doctoral internship program in psychology is accredited by the American Psychological Association, Commission on Accreditation. Florida State University describes its admissions process as “selective” and “holistic” with no single criterion having more importance than any other. The university examines the high school or college record of the applicant, as well as the standardized tests submitted during the application process. Students must graduate from an accredited high school to secure undergraduate admission or an accredited college to obtain graduate admission. High school applicants must satisfy minimum requirements for subjects that include language, social science, natural science, English, and math. Meeting the minimum expectations for these courses does not guarantee admission. All students must also submit standardized test scores, but undergraduate applicants may choose the ACT or SAT and don’t need to submit both. Tuition for students at Florida State University varies based on a student’s status in school, as well as his or her state of residency, and the location where the student attends classes. The in-state rate for each credit hour for Florida residents is $215.55, and the out-of-state rate is $721.10. For graduate students, the in-state rate is $479.32, and the out-of-state rate is $1,110.72. Other rates are charged for the Panama City and Sarasota Campuses, as well as for the College of Law and distance learning programs. Students in distance learning programs at the undergraduate level will pay $180.49 if they’re Florida residents or $686.04 if they’re from out-of-state. Graduate rates are $444.26 for in-state students and $1,075.66 for out-of-state students. To qualify for financial aid at Florida State University, students must submit their FAFSA form, which is available on October 1 of each year. Students are encouraged to submit their form as early as possible. Once the form is submitted, students will receive a notice from the school’s Office of Financial Aid that indicates the type of financial award offered. Students may qualify for federal student loans, grants, and Work-Study awards, as well as institutional, state, and private scholarships. Some students may also consider private student loans if they need additional assistance paying for school. Scholarships available to students at Florida State University include the National Merit Finalist Scholarship, Tuition Reduction Scholarship, and the Presidential Scholars Program Scholarship.